When your organisation loses power, an uninterruptible power supply (UPS) is a critical piece of hardware that keeps your organisation-dependent IT systems powered while you put your business continuity strategy into action. That plan may be to push your data to a remote location to continue business operation or it could be something as simple as just shutting down storage devices to prevent data loss. Whatever your plan, wear and tear can turn your ace against a technological shutdown into a joker. 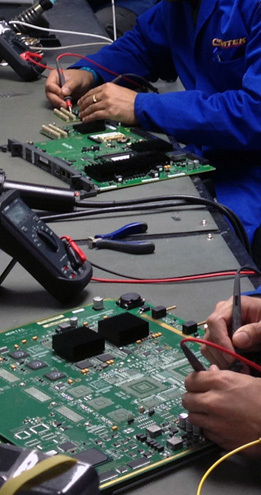 Comtek’s UPS repair service restores a wide variety of UPS devices from manufacturers such as APC, Eaton, Vertiv, BPC and Borri. Unlike much of our competition, our experienced expert engineers are able to perform board level repairs to a professional standard. In every repair, your UPS will undergo our strenuous testing and refurbishment on all sub-systems, including a 48 hour soak test along with a warranty giving you back your UPS with complete dependability. Join thousands of our customers who have taken advantage of major cost savings by repairing their network hardware over replacement and request a quote today. Use our contact form to request a quote. Is your network protected from power surges? When your UPS breaks down, you need a service you can rely on to restore your safeguard against data loss and power surges. Our support contracts can support just about any item of network or telecoms hardware that deliver saving of up to 80% over traditional maintenance support contracts from manufacturers. We provide SLAs for a rapid response in as little as four hours or next business day for a parts-to-site contract. When the part can’t be fixed on site, the faulty unit can be sent to our workshop for a high-quality repair. As part of our belief in reducing e-waste, we support a vast range of hardware that isn’t just the latest in UPS hardware but also the hardware deemed “end-of-life” by manufacturers. Comtek holds stock of new and refurbished UPS systems from manufacturers such as: APC, Exide, MGE, Powerware, Liebert, Schneider Electric and Tripp Lite. Our refurbished units are supplied with new batteries, fully tested and warrantied with prices that provide considerable savings compared to the cost of brand new retail units.